Before laying the pipes and fittings must be checked for damage that may have occurred in transit or storage prior to installation. Damaged pipes or fittings must not be installed. The laying should be commenced at the lower end of the pipeline run (from the outlet). The pipes are usually laid so that the sockets face to the top of the pipeline run. When 2 pipelines are laid side by side appropriate separation should be allowed to permit the appropriate compaction of the material between the 2 pipe runs. Sealing rings are enclosed separately in order to avoid damages. The bedding material is laid below the Condron Concrete Twinwall Road Drainage pipe to provide uniform support and to permit small adjustment of the pipe’s line and level. All bedding material is to be compliant with the engineers’ specification. No temporary supports (blocks of bricks, stones, wood, metal or other similar objects) should ever be used to prop the pipe during the installation process as it can damage the pipe integrity and cause pipe deformation. The embedment, the main backfill and the removing of the shoring should be carried out in order that the pipe connections and bedding are capable of bearings. The material for the bedding, the main backfilling and the covering shall meet the planning guidelines. Each covering has to be compacted either by hand or with a compacting plant. The covering above the soffit shall have a height of 300mm. For the main backfill the excavated material can be used, once the particle size is not larger than 300mm. For the main backfill equipment for mechanical compaction may be used. It is important to ensure that the main backfill is carried out in accordance with planning guidelines and NRA Manual of Contract Documents for Road Works (MCDRW). From DN/ID 150 – 450 mm the CCW Twinwall Pipes are available with a fixed socket or a connection collar. 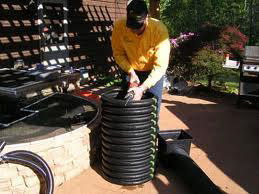 Before laying the pipes and fittings must be checked for damage that may have occurred in transit or storage prior to installation. Damaged pipes or fittings must not be installed. The laying should be commenced at the lower end of the pipeline run (from the outlet). Putting on the sealing ring. 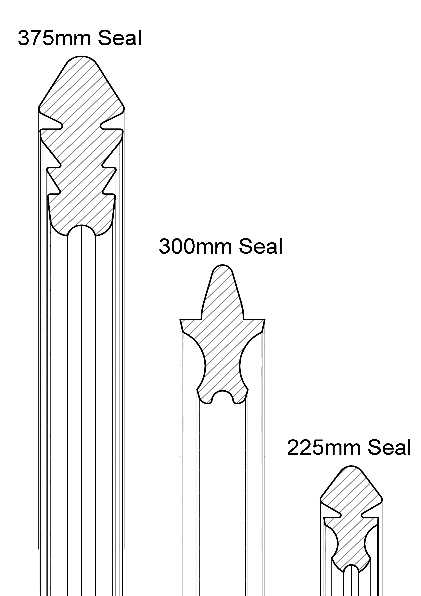 Prior to inserting the Rubber Sealing Ring, determine the “Pipe Insertion Depth” by assembling the pipe Spigot end fully into the Socket / Coupler. Using Chalk, mark the position on the Rib of the pipe that lines up exactly with the entrance point of the Socket / Coupler. Prior to jointing, ensure the pipe Spigot end, Rubber Sealing Ring and Lubricant are clean and grit free. Assemble the Rubber Sealing Ring into the first corrugated valley of the pipe Spigot end – ensuring that the text marked “TOP” on the Rubber Sealing Ring is orientated towards the top of the pipe. Open the lid on the tub of approved soluble / inert Condron Concrete lubricant, and (using a clean paintbrush) apply it around the outside perimeter of the Rubber Sealing Ring and also around the inside circumference of the adjoining Socket / Coupler. 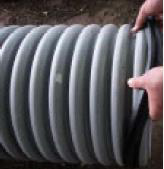 Connect the Condron Concrete Twinwall Road Drainage pipe with constant axial force up to the previously marked insertion depth, without overloading the pipe components. The Condron Concrete Twinwall Road Drainage pipes must be laid in accordance with design specifications regarding the level and grade limits prescribed by the planning requirements and the NRA Manual of Contract Documents for Road Works (MCDRW). The CCW Twinwall Pipes must be laid in accordance with design specifications regarding the level and grade limits prescribed by the planning requirements and MCDRW. Pipes of smaller diameters can be pushed together by hand. For larger pipe diameters, the use of equipment is required while the pipe should be protected at the end and no excess force is used. NOTE: This method requires use of installation stub. DO NOT push directly against pipe. Pipes must be cut with a fine-tooth saw or other suitable tool to ensure that the cut is clean and plumb. All cuts should be made in the centre of the appropriate pipe through and vertical to the tubular axle. Ridges and unevenness of the cut pipe end should be removed with a rasp or bevelling tool. The CCW Twinwall Pipes may be connected to other pipes with an appropriate adapter. It is not recommended to install clamp-connections or other connection options on the outer layer. You should always use CCW Twinwall Pipes adapters. Adaptors available in various sizes.